These ankle skinny jeans feature 5-pocket styling and a single-button closure. Tonal stitching at back pockets. Wrinkling and whiskering at front. Shredded holes, worn spots, and moderate distressing. 11" leg opening. * 8" rise. 28" inseam. * 92% cotton/7% elasterell/1% spandex. This is a very flattering skinny with dark coloring and the distress was minimal. I love how soft they are. Just a warning that if you read some of Paige size charts and they say to size down, I would say it's wrong for this pair. Def order your reg size in Paige. I am in love with them and wear them w flats, riding boots, platform shoes/boots. I was excited to see that these jeans came in a 23, because I have noticed that size 24 in other brands just do not fit me perfectly. When I received these jeans the colour was a lot lighter than in the photo above. Also the size 23 looked like they were at least a size 25. I thought maybe I was sent the wrong size but I wasn't. These jeans fit more like s cropped straight legged jean than a skinny jeans. If you do want to purchase these jeans make sure you go a size down. But for $200 bucks they did not live up to my expectations so I returned them. It's so exciting to see my collaboration jeans on sale! I hope you all like them. 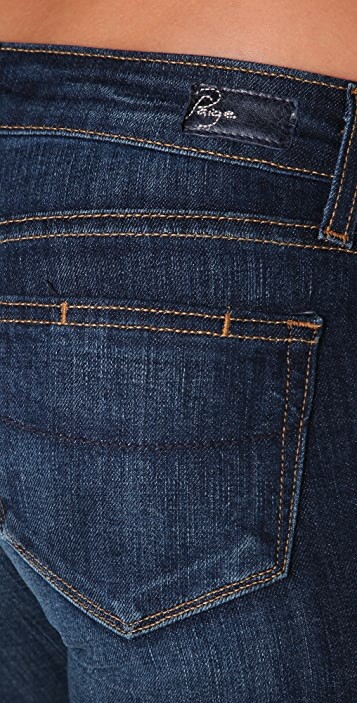 The material is quite stretchy and it does run slightly bigger than other Paige jeans due to the stretch. Lorna.